As I mentioned in my Pre-Paris book haul, I picked up this book because I wanted a lightweight paperback that I could immediately get into, and some of you commented saying I would love this book. Well I did. Five-year-old Jack was born in Room and has never left. He wakes up in bed with Ma, they have breakfast at Table, use Toilet, have a bath, move Rug off the floor so they can do Phys Ed., have lunch, read books off of Shelf in Rocker, and then have dinner. But Jack must be asleep in Wardrobe by 9, because sometimes Old Nick visits and creaks the bed. But then later Ma will bring Jack into Bed with her. To Jack, Room is home. But for Ma, it is a garden shed-turned-dungeon that she has been stuck in for six years since Old Nick kidnapped her from the university parking lot at age 19. She has made the best of it, giving birth to Jack on her own, and raising him as best as possible given the circumstances. But Ma knows that one day they will need to escape so Jack can have a normal life and she can finally be free from her captor. What surprised me most was the effectiveness of having the narrator be a five-year-old child. 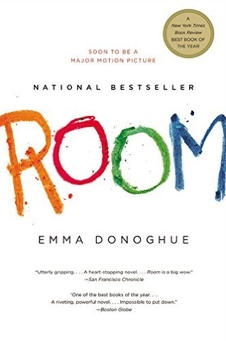 At first I was skeptical, wondering how such a tragic circumstance could be conveyed through the words of a child, but in fact that is a large part of what made this book so good. Through Jack’s naïve descriptions of daily life and of Old Nick, the horror of the situation is shown from the alternative perspective of a child who knows nothing else. What I Loved Most: This book is divided into five sections: Presents, Unlying, Dying, After, and Living. Each one of these sections marks a major change in the plot, and helped me to compartmetalize the progression of the story. When I first read the titles of these sections, they made no sense to me, but once I started reading each section, their meanings became clear within the first few pages. Not having chapters was an adjustment, but I found chapters would have chopped up the story too much. What I Loved Least: At first, I really didn’t like all the grammatical errors, run-on sentences, and sentence fragments, as I found they made the text harder to read and distracted from the story. But as I got more into the book, I found that without these deliberate errors, it would be hard to believe the narrator was a young child, and would have taken away from the naivety on which the narration operates. I look back one more time. It’s like a crater, a hole where something happened. Then we go out the door. Final Thoughts: The New York Times book review said it perfectly: “Thrilling and at moments palm-sweatingly harrowing . . . A truly memorable novel.” It is one of those books you will want to read all in one go, but at the same time you’ll want to pause and think about the power of the noven. Such an amazing read. I would recommend this to anyone. Next up is George Orwell’s Animal Farm for a book with a non-human main character!! !